Hey everybody! It’s Andy Gesner and the staff at HIP Video Promo checking in to say thanks for all your support this summer! It is very much appreciated. Get prepared for lots of way cool indie rock vids coming to you this autumn, starting with The Network, courtesy of our new friends at San Francisco based Adeline Records. The Network are a synthesis of electronic new wave pop and sarcastic social commentary, a post punk tsunami wrapped in an enigma. Who are these Network guys? They refuse to show their faces. Their combined achievements, according to their bio, include “two Olympic medals” and “messing with Texas.” They hail from far and wide… from the cool, crisp hills of Scandinavia to the rough and tumble slums of Buenos Aires. They play music that’s edgy to the point of being serrated – a spare, accurate sound with the kind of intense but carefully controlled and directed energy rarely encountered outside a cyclotron. And you can just about see their tongues in their cheeks behind the masks. The first clip, “Supermodel Robots,” typifies the band’s blend of precise musicianship with sardonic wit. Director Roy Miles from ANTIDIVISION gives the video an analog-processed look that’s descended from video art pioneer Nam Jun Paik – if Paik had been out drinking with Tom Waits. The second vid, “Spike,” is a study in desperation and pathos, played with the urgency of impending withdrawal. The spoken-word lead vocal is an all-too believable slice of modern urban lowlife. A change of pace from the other two, the video here is distinguished by the rapid fire multilayered animation of found images such as post cards, Rand McNally Road Maps, and the ads from the back pages of comic books. Rounding out the trilogy is “Joe Robot,” the most accessible and viewer-friendly of the three. A lovable, grinning, almost cuddly animated robot takes his instrument out of it’s immaculate cold storage and tries to make friends. Like Devo’s “Mongoloid,” Joe brings home the bacon. Unlike the gritty “Spike” and the almost sleazy ambience of “Supermodel Robots,” this one has a feel of a futuristic cartoon. So who are these guys? They’re The Network, and their debut CD Money Money 2020 will be available September 30th on Adeline Records. 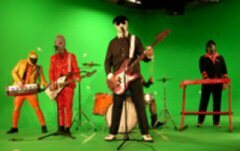 Commercial radio in both Chicago and Los Angeles (KROQ) are raving about the first single, “Supermodel Robots” and the buzz about The Network is reminiscent of The Residents when they started turning heads and dropping jaws. To get programmers excited about the impending release, HIP Video and Adeline Records are teaming up to bring you a contest that is sure to please. Any programmer that adds a video from The Network in the month of September or October will enter a drawing to win the complete catalog of Adeline Records releases, including albums from AFI, Green Day and The Soviettes. A programmer can increase their chance of winning by programming more than one video since each video played will have it’s own separate entry in the contest. We are going for adds for “Super Model Robots,” “Spike” and “Joe Robot” on October 3rd and October 6th. For info, call Andy Gesner at HIP Video at 732-613-1779 or e-mail info@HIPVideoPromo.com . The drawing will be held on Friday, November 7th.